The story about this recipe from Ireland. There is a story behind this recipe, and here it is. 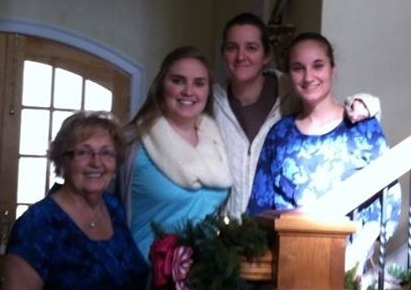 In December 2014, I was invited to a brunch in the home of my maternal cousin Ruth Beitzel in western Maryland. 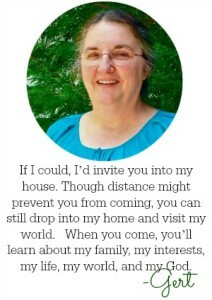 She told me I could bring five guests with me. I invited my sisters Rachel and Alice. Alice brought her daughter Christi and I brought my girls, Sarah Beth and Rebekah. At the end of our brunch, Ruth served this pudding and sauce. We begged her for the recipe! Chopped dates, real butter, and self-rising flour along with seasonings and spices make this a delicious dessert. And the sauce? Oh.my.goodness. Real butter, sugar, and heavy cream stirred together over low heat leaves one with a scrumptious sauce topping. Ever the gracious hostess, Ruth gave the recipe to us. She also shared the story of how she got this recipe. In late January of 2015, the same sisters came to Virginia to help celebrate my 60th birthday (now you know how old I am.) 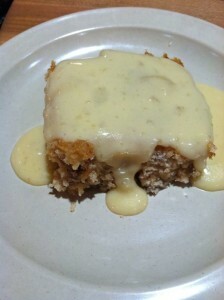 They helped prepare this cake (sticky toffee pudding) and sauce; we served it to some fifty guests that evening. Try it. I won’t be surprised if you, too, will think it’s the best (or one of the best things) you’ve put in your mouth. I am including the original recipe and our conversions. This is the original recipe as it came to me from my cousin, who got it while visiting in Ireland. I am including the original recipe and our conversions. When you make the sauce, be aware that it will take you 30 minutes. 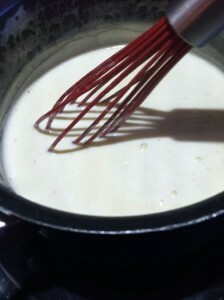 Stir it constantly and add the cream a little bit at a time. It is worth every minute you spend stirring the sauce! Simmering the sauce forever and ever! **Confession: the day of my birthday party, the sauce didn’t want to thicken. We had never made this before and didn’t know what we were doing. My sister added 1 teaspoon cornstarch (dissolved in a little of the sauce and then added to the rest of the sauce). It thickened quickly. We don’t know if it was the cornstarch or the timing!